I love Pinterest. I go there for ideas before I look other places because it is easy to look through the images and open only what you are interested in. I would say it's a time saver but we all know it isn't because there are too many great things to see there. The first card is a direct CASE with the exception of the words (I didn't want to dig out the set and made do with what I had on my desk). I love Connie Babbert's cards. She is one talented lady. As you know, I'm a procrastinator. I've known for a bit that I needed to get 40 cards made to hand off so teachers and music leaders could be appreciated for what they do. Due to it being fall (not that you can tell here in FL), I wanted to use one of my fall sets. I just couldn't get into it. I tried. I'm pre-occupied with other projects and they are what I think of right now. Some are fun and some . . . eh, not so much. 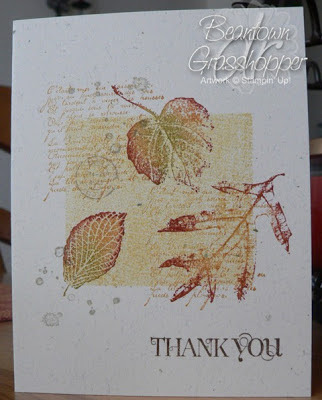 After looking for some inspiration for something easy, that wouldn't cost extra postage, that wasn't too labor intensive with cutting, I came across a card like this on Pinterest. Ha! Just what I needed. I went to the blog but it didn't have colors other than a Kaleidacolor (?) and gray. I don't have any of the Kaleidacolor stamp pads any more. A friend kept them about 7 years ago and I really didn't care because I never really used them.